Fabulous Resort Great location friendly staff had a ball. Pools are awsome. If you’ve got a holiday coming up and you have no clue where to go, throw your hands in the air and say “Phuket!” Whether you plan to keep it low key and classy or hit the scene like Dr Dre after a long absence, Phuket takes the cake—the sticky-sweet, red-rice cake, to be exact. So, if someone found you cheap flights to Phuket, would you take them? “Heck, yeah” you say? 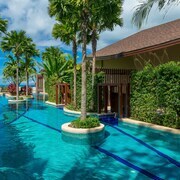 OK, let’s go Your Phuket holiday awaits. At lastminute.com.au, we have a very sophisticated classification for island provinces like Phuket: freakin’ awesome. 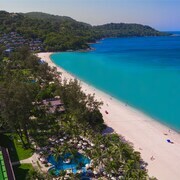 With gorgeous bays scooped into all sides of the main island and quiet islets nearby, Phuket hotels line up along the beaches for their shot at “Best Ocean Views.” Wanna see more of the “Land of Smiles”? Book your Thailand accommodation from Bangkok to Chiang Rai with us. There isn’t much that you can’t do on this lush Thai island located in the Strait of Malacca, but after touring the Chalong Rum Distillery, you might be willing to try your luck, so get a move on! Find your inner Zen by visiting the Big Buddha in the southwestern region. Street markets are what’s up in Phuket, and you’ve got several to choose from. The Malin Plaza Patong isn’t exactly where you’ll find the best food in Phuket, but it can satisfy your nighttime munchies with cheap eats. To scoop up souvenirs from dusk to dawn, don’t miss Phuket Walking Street in Old Town or Phuket Weekend Market, the largest night market in Phuket. Hey, size does matter. Not sure what to order among the tempting market treats? Slurp down kuay tiew soup from a food cart or make it your life’s mission to find the best pad Thai in Phuket. With excellent fresh seafood island-wide, we wouldn’t judge if you settled in with a bib and went full foodie. 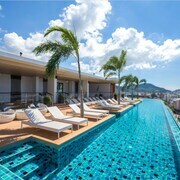 At this point you could relax in one of the beachfront hotels in Phuket, or you could take in a glitzy show, complete with an elephant army, at the Phuket FantaSea Cultural Theme Park. 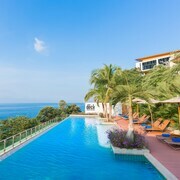 Book flights to Phuket with lastminute.com.au and fly to Phuket International Airport (HKT) in Phuket Town, in the northern region of the island. From there, you can hail a taxi to scope out top sights and accommodation in Phuket, or you can take the wheel into your hands with one of our great car hire deals. The island is also famous for its bright tuk-tuks—the best way to meet locals is to hop on! The hottest and wettest part of the year usually ends in May, so by June and July the residents of Phuket have had time to dry off and are in the mood to celebrate. They start things off in mid-July with the Kathu Festival—think of it as a large street fair along Main Street in Kathu Village. Here’s your chance to fill your suitcases with handmade souvenirs to impress your friends back home. Don’t miss the cool lion dances and martial arts demonstrations. 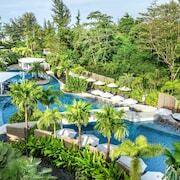 Also in July, if you don’t mind tying a cardigan around your shoulders and slipping on some Dockers, you will fit right in at Cape Panway Hotel Phuket Race Week. Watch an international collection of yachts race around and practice your upper-crust phrases, such as, “I do say” as you take another helping of caviar. Finally, if you only have one day in Phuket and want to see something that you’ll never be able to wash out of your eyeballs for the rest of your life, stop by during the Phuket Vegetarian Festival. Sounds soft, sweet and kind of harmless, right? Wrong! Though the actual holiday is meant to celebrate the Chinese community’s belief that foregoing meat during the ninth lunar month will lead to good health, the real draw is the huge procession. This isn’t exactly your local town parade. The procession includes “god-mediums” who perform bizarre and shocking acts of self-mortification to prove their faith. We recommend holding off on eating before you take in this particular show. If you’re ready to party like it’s 1999, then you’re in the right place. 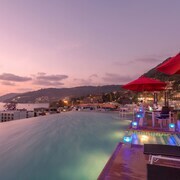 Phuket, more specifically Patong, is one of the most famous and wildest party scenes in the entire world. Ditch your Phuket accommodation and start your night at an amazing restaurant, filling up on delicious seafood dishes, and then…well, the rest depends on how crazy you want to get. Dancing on the table with a lampshade on your head? Yep, you can do that at any number of nightclubs clustered along Bangla Road. You can also swing into a go-go bar, enjoy a massage, get lost in a dive bar or generally just go wild. Phuket doesn’t judge, and as long as wisely keep your phone off for most of the night, no one has to know what put that big grin on your face except you! If you need to recover from all the fun you had in Patong, it might be time to bid farewell to Phuket, at least for a day. Charter a boat and sail away to one of the beautiful nearby islands, such as Phang-nga Bay or Phi-Phi, Khai. Here you can laze away in a cabana and re-read the entire Harry Potter series like you’ve always promised yourself. But come on! You’re literally on a tropical island. Now is the time to try some scuba diving, zip across the waves on a jet ski or see what the little fishies are up to with some snorkelling. Still got that cardigan handy? You can always rent a yacht and be a captain of your own ship…at least for a day. 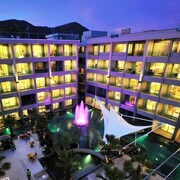 We’ll make you feel like a captain of the world when you save big on places to stay in Phuket, travel, events and more. Your island adventure awaits and with lastminute.com.au, you have no more excuses for the holiday of a lifetime.